(VEN) - 2015 is due to be a very important year with many landmark events for the country’s development. During this year, Vietnam will celebrate the establishment of its diplomatic relations with many countries as well as conclude several trade negotiations. Effective from 2015 onwards, Vietnam will implement its commitments and obligations as laid out in the framework agreement with the World Trade Organization (WTO). Free trade agreements (FTAs) which have already been signed, new-generation FTAs which are under negotiation, as well as the scheduled establishment of the Association of South East Asian Nations Economic Community (AEC) will create many new opportunities for Vietnam to promote its trade with the US, Japan, and the EU. At the same time, the level playing field of this newly-integrated market will put pressure on Vietnam to raise its standards across the board and make its economy much more competitive. This year, Vietnam will celebrate the establishment of its diplomatic relations with many important partners including the EU and the US, as well as Russia, Germany, and Indonesia. As such, this will be a good time for Vietnam and these countries to boost their cooperation in trade and investment, while deepening their relations across a wide range of fields. After the EVFTA is signed, trade between Vietnam and the EU is expected to grow 10-15 percent in 2015 and by an additional 20 percent within the next three to four years. 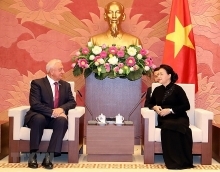 Regarding the prospects for Vietnam-EU cooperation in the time to come, Ambassador Franz Jessen, Head of the EU Delegation to Vietnam, said that Vietnam-EU relations showed remarkable progress in 2014 and were expected to bring about good results this year, especially after the EU-Vietnam Free Trade Agreement (EVFTA) is signed. This agreement is scheduled to foster opportunities for Vietnamese businesses by promoting exports to the EU market. 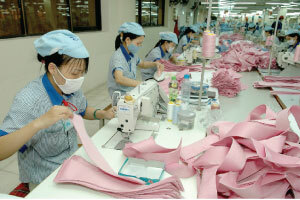 After the EVFTA is signed, trade between Vietnam and the EU is expected to grow 10-15 percent in 2015 and by an additional 20 percent within the next three to four years. Notably, 2015 will see the celebration of the 25th anniversary of Vietnam-EU diplomatic relations. Attaching great importance to cooperation with Vietnam and considering it as an important partner in the Asia-Pacific region, the EU will join Vietnam’s efforts to develop bilateral relations to make them more practical, effective and comprehensive. Confirming the fact that Indonesia is one of Vietnam’s most important partners in the ASEAN region, Indonesian Ambassador to Vietnam Mayerfas added that cooperation between the two countries was expanding more than ever in economic, cultural and political fields. This year, Vietnam and Indonesia will celebrate the 60th anniversary of the establishment of bilateral diplomatic relations. As part of these celebrations, the Indonesian Embassy in Vietnam will organize a range of trade, tourism, and investment promotion activities in the larger cities of Vietnam to promote trade and investment between the two countries. Ambassador Mayerfas emphasized that the AEC would be a fulcrum point for boosting economic cooperation between ASEAN countries, and especially so between Vietnam and Indonesia. Despite numerous challenges to be overcome on the path towards international integration, Vietnam has improved and will continue to enhance its global position.